(NaturalNews) Growing fields are not the only place where conventional and genetically-modified (GM) food crops are exposed to a barrage of toxic chemicals. 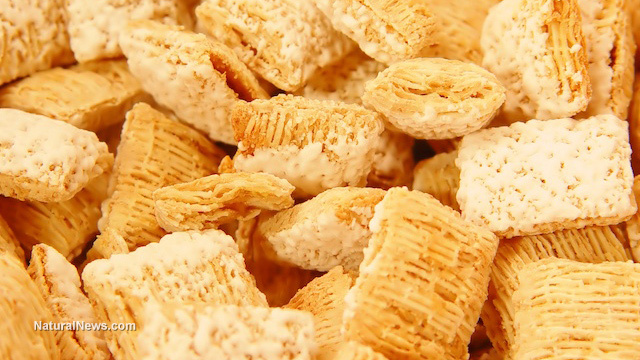 It may come as a surprise to some, but many of the ingredients used in popular breakfast cereals are heavily fumigated in large storage bins prior to being processed and packaged for human consumption. Cereal Crimes: How "Natural" Claims Deceive Consumers and Undermine the Organic Label -- A Look Down the Cereal and Granola Aisle, a recent report put together by the good folks at the Cornucopia Institute, reveals that many ingredients in conventional breakfast cereals are fumigated with deadly gases like chlorpyrifos methyl, sulfuryl fluoride, ethylene oxide, and propylene oxide as soon as 24 hours before being packaged, boxed, and shipped to grocery stores. Corn, wheat, soy, rice, oats, barley, peanuts, and raisins, which represent some of the most common cereal ingredients, are typically stored in large storage silos prior to being processed and packaged. In order to deter insects, rodents, mold, and other harmful invaders from contaminating or destroying these ingredients, chemical "grain protectants" are typically applied -- and these toxic fumigants often leave residues on the end product. Chlorpyrifos methyl, a common cereal ingredient fumigant, is known to cause neurological problems, respiratory paralysis, kidney and adrenal illness, and even death. Among conventional and "natural" cereals sampled by the US Department of Agriculture (USDA) as part of its Pesticide Data Program, 16.7 percent of cereals containing non-organic wheat grain, and 20 percent of cereals containing non-organic wheat flour, contained chlorpyrifos methyl. Sulfuryl fluoride, another chemical fumigant, is often used on almonds, oats, wheat, corn, rice, barley, peanuts, and raisins. The "Applicator Manual" associated with the Dow AgroSciences branded version of the chemical, known as ProFume, explains that sulfuryl fluoride is a "toxic gas used as a post-harvest fumigant to kill pests in storage." It adds that fumigated product can be packaged and shipped out to consumers as early as 24 hours after the gas is applied. Ethylene oxide and propylene oxide are both known carcinogens as well. Ethylene oxide is often applied to commercial spices like cinnamon, and is known to cause lung damage, reproductive disorders, mutagenic changes, and neurotoxicity. Propylene oxide, which is used on raw nuts, is known to cause nervous system problems and inflammatory lesions in the nose and lungs.